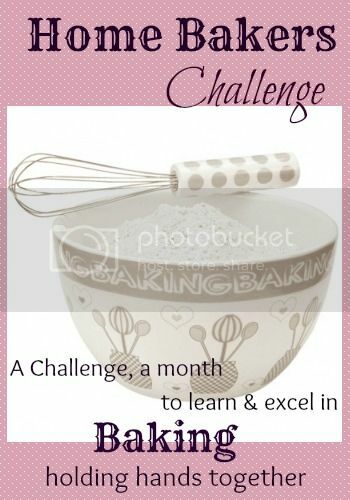 It's the second Tuesday of the month and it's time for the Bread Baker's monthly bread! This month Wendy of A day in the life on the farm suggested to bake any international bread. I was looking for an easy bread as I knew I would end up baking at the last minute with no extra time to bake another batch if my first attempt failed!! 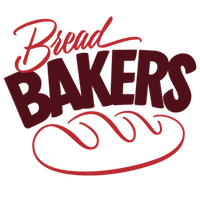 If you love baking bread and want to join this wonderful bread baking group, scroll to the end of the post for further details. I had Bialys bookmarked long time back when I saw some posts from my fellow blogger friends. I followed the recipe from King Arthur Flour. Bialys is a chewy round Polish bread with a small depression in the middle filled with onions and poppy seeds. The original recipe calls from high gluten flour which lends the chewiness to the Bialys but if you can also use all-purpose flour with vital wheat gluten as substitute. I added a pinch of curry powder and garam masala to the onion filling for an Indian touch :) Off to the recipe now! 1. Add the flour, yeast, salt and water in a food processor and knead till the dough comes together. 2. Knead by hand for about 5-7 minutes or until you get a smooth and failry stiff dough. You can use your stand mixer or bread machine to knead. 3. Place the dough in a lightly greased bowl and cover it. Keep in a warm place for about 1 1/2 hours or until it's just about doubled. 4. To make the filling, heat a pan and add olive oil. Add the garlic, onion and fry over medium heat till it's dark brown. Add poppy seeds, pepper, salt and combine. Set aside to cool. 5. Gently deflate the dough and divide it into 8 balls. Take a ball and shape into 4" to 5" circles with a small rim. Keep the remaining dough covered. 6. Place the shaped circles on a parchment-lined or lightly greased baking sheet. Prick the center using a fork. Place about a tablespoon of the onion filling into the center of each bialys. 7. Preheat the oven to 230 C | 425 F.
8. Top the bialys with a sheet of parchment or aluminum foil and then with another baking sheet. 9. Bake the bialys for 4 minutes. Remove them from the oven, and remove the baking sheet and parchment or foil. 10. Return the bialys to the oven, and bake for an additional 7 minutes, till they're a slightly golden brown. Remove from the oven and cool on a rack. Original recipe calls for high gluten flour. You can refrigerate the dough overnight after the first rise. Next day, haw for 30 minutes and proceed with remaining recipe. Great job Sona.....I am going to make these for my husband's family the next time we all get together. Polish bread with an Indian flair! Sounds perfect! I love bialys, and your little wading pools look wonderful. I love the addition of the spices to the filling. 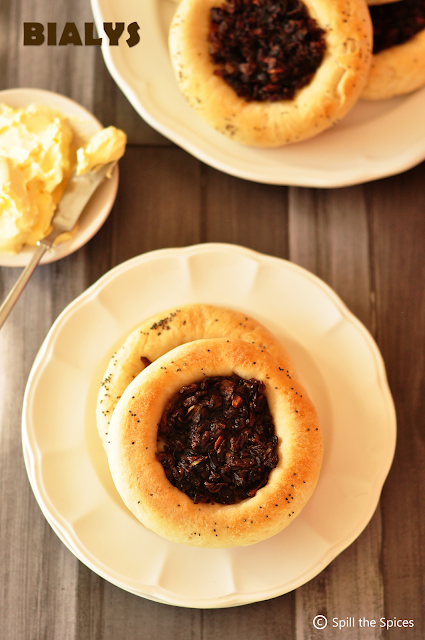 That would be a delicious twist on the traditional Bialy. 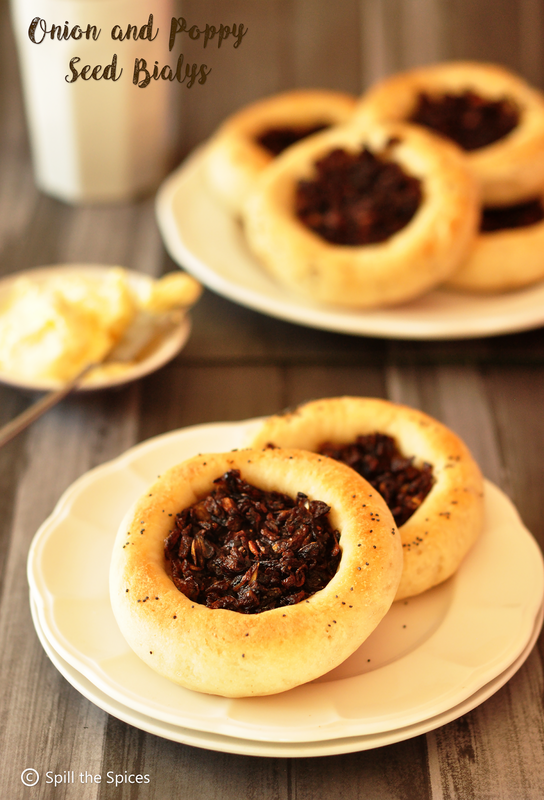 Wow, you have a long list of bread bakes..these bialys look so cute with the caramelized onion mix. That is one delicious bread. Love the Indian touch. Hello Sona, I have never baked bailys and your post motivates me to bake a batch. I am sure that the filling makes them delicious. Can imagine the crunch of the poppy seeds. Lovely recipe indeed. Perfect looking bialys. Love the addition of curry powder and garam masala to the onion and poppyseed mixture. looks so amazing.. can I have that? Wow, I love these cheesy and chewy bialys. Actually I love anything with caramelized onions, so these are just perfect. Wow, those rolls look so flavorful and delicious! This bread looks so different. I am sure they will be great choice for a small get together or kids celebrations. 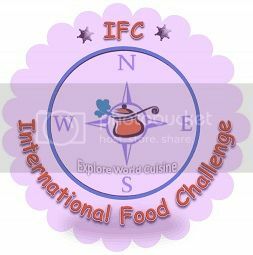 I hope we can make more alternative fillings for this.